Epona, horse goddess or fertility goddess? During my research to the function of the Gallo-Roman dodecahedron, I came across a large number of possible explanations. Eventually, the research turned to the formulating and testing of the hypothesis that the dodecahedron is an astronomical measuring instrument that was used for the determination of the optimal sowing date of winter grains. In the support of this hypothesis, a connection has been made between the use of the dodecahedron and religion. Next, I started to wonder which goddess in the former Gallo-Roman society could be related to the dodecahedrons. Keeping in mind that - according my theory - dodecahedrons were used on for agriculture, a link with the fertility goddess seems most likely. These goddesses are mostly portrayed with fertility symbols like plates with breads or fruits or the cornucopia. A goddess that is often portrayed with fertility symbols and is well known in the Netherlands, is Nehalennia (picture. 1). Nehalennia was mostly worshiped in Zealand. This goddess is however related to sea freight and commerce .She is seen as a protective goddess that had to ensure a safe transport overseas. The fertility symbols related to this goddess are seen as signs of prosperity and are not related to agriculture. Another, less known goddess amongst Dutch archaeologists who is portrayed with fertility symbols and of which the acreage has similarities with the dodecahedrons, is Epona (picture 2). Epona is not being linked to agriculture in mythology but she is seen as a Celtic goddess that protects horses. On the pictures, she keeps being depicted with one or more horses. This is why she got the name horse goddess. 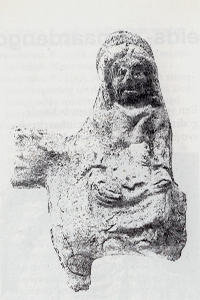 In a recent publication (1993), Marion Euskirchen looks thoroughly at topics like acreage, the archaeological context and the meaning of this goddess in the former society. The acreage of Epona is focussed in the North-western -part of Europe and the statues and reliefs which are known from her, date back mainly to the second and third century AD. The archaeological context is, according to the most common contexts, very divers: Villae rustica (25), military camps (26) and temple complexes (25). In the list with sites, Euskirchen names two Dutch findings in Baarlo (Limburg) which are in the possession of the National Museum of Ancient times in Leiden. Picture 3 shows the best preserved example. The fact that there are about 300 pictures known from her shows that she must have been an important goddess in the Gallo-Roman era. It is remarkable, in the case of Epona, there is a relative large number of pictures found near villaes. It is of course possible to relate the picture of a horse with a horse, keeping the relation with agriculture in mind. That thought is that obvious that any other option seems illogical at first. Still, I started to wonder if there was any other explanation possible. What would that be then? The research to the function of the dodecahedron gave me a clue. Parallel to this research I wondered if a relation with astronomy could offer an explanation. This lead eventually to the association with the constellation Pegasus. In that case, the picture of a horse could symbolically refer to this constellation. The constellation Pegasus is best visible at our latitude during September/October, when the winter grains need to be sown. What at first seemed an illogical explanation, gradually developed to a probable hypotheses to me. I will support this in the following chapters. Epona is being depicted sitting or half laying on a horse or she is being depicted next or in front of multiple horses. The only thing we can conclude is the already known horse-goddess relation. The most important clues can be found in the details. 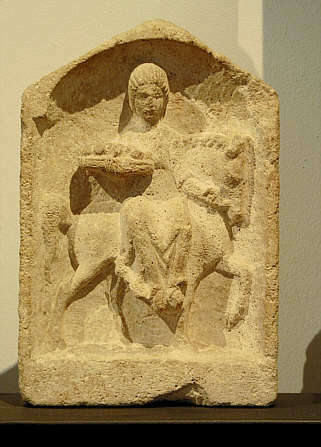 Epona keeps being depicted with fertility symbols like dishes with breads or fruit or with the cornucopia. She is also frequently depicted with a mare and foal where the foal is being used by the mare (picture 4). 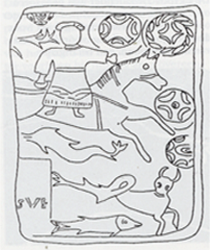 Furthermore, there is a picture known where Epona is being depicted on a horse, surrounded with heavenly patterns. (picture 5). The presence of fertility symbols fits perfectly in my hypotheses because we may expect that a fertility cult belongs to the sowing of winter grains. The presence of some pictures of a foal besides a horses has a symbolic meaning and can be connected with new life or rebirth. When sowing grain, the grain itself has to die in the ground to be able to sprout and to grow into a new fertile plant in springtime. This meaning can be related to her presence on burial monuments. When one is convinced of life after death, then this fits into the theory of rebirth. The picture of Epona, surrounded by heavenly designs fits into my hypotheses that the meaning of the horse has to be associated with astronomical observations. Some less clear pictures show a horse that kicks its hoof on a rock from which a well arises. Euskirchen wrote the following: : " Auf einigen Bildern der Epona sind jeweils unter dem erhobenen Huf des Pferdes Gebilde zu entdecken, welche u.U. als Zitat des quellaufschlagenden Pferdes gemeint sind"... This picture probably refers to Greek mythology where the horse Pegasus pushes with its hoof against a horse and at that moment the well Hippocrene wells up from the mountain of Helikon. After Pegasus has set its hoof against the rock, he took in his place between the stars. The relationship with the horse and water is being emphasized by the findings at the terms and in the water spring. We could of course explain this easily by linking the birth of the well of Hippocrene to it. When we limit our attention to the Gallo-Roman area, we could place a link with the autumn period, when the winter grains are being sown. In this period, there is a fairly amount of rain that is necessary for the fertility of the fields. The picture of Epona with a dog on her lap has probably also a symbolic meaning. After having linked the horse with the zodiac sign of Pegasus, I asked myself if there could be a similar explanation found for the picture of the little dog. For those who know a bit about astronomy, the explanation that the little dog is indeed the zodiac Great Dog (Lat: Canis Major). The most important star in this sign is the dog star Sirius. The Egyptian goddess Ises is often depicted sitting on the dog star of Sirius and is - in mythology - being compared with the Greek goddess Demeter and the Roman goddess Ceres. The Egyptian calendar was based on Sirius, thus it is possible that the Gallo-Roman area, the star had a significant meaning, before the arrival of the Roman troops. The dog sign Big Dog is at our latitude only visible during the evening hours in the winter period. The dog on the lap of Epona is a symbolic sign for this period in which the grain seeds try to live through the winter. In a similar way, it is possible to explain the meaning of the dog with which Nehalennia often was depicted. It is probable that this symbolically portrays the winter period. For sailors and merchants from Zealand who had to organise the transports over sea, the winter period was probably the most dangerous period of the whole year because of the high risk of storms. 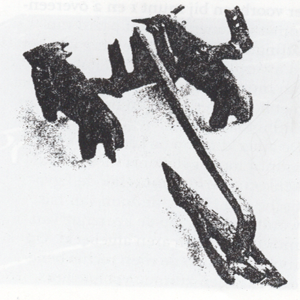 The measurements are about 100 by 35 meters and the image dates presumably form the irn age. The image of this horse is, according to me, largely based on the astronomical observations that need to have had a great meaning for the agriculture of that era. The tail, back and neck of the horse should be seen as the sine movement of the earth in comparison with the sun (ecliptica). If one should measure the length of the shade every day at the moment that the sun reaches its highest point of the day of an upright item, this sine will be acquired in the course of the solar year (hoping that the sun will shine every day). The square head of the horse is formed by the four stars that, in astronomy, make the torso of the zodiac sign of Pegasus and are known in astronomical terms as the autumn square. The fact that the Celts have chosen the head of the horse can be explained by the fact that the Celts consider a head to be of great importance. In Celtic religion, they were convinced that the soul was to be found in the head, as a result of which the head had a very special meaning in life after death. The difference in the drawing of the shape of the hind legs in comparison to the front legs of the horse is remarkable. The hind legs could be associated to a reaping hook for the mowing of grains because of its curved shapes. It is however also possible that the curve resembles the curved shape of the moon. Nowadays, there are calendars for alternative agriculture methods known in which the zodiac signs, planets and the moon are being considered to be important for the moment of sowing or harvesting. These calendars are published yearly because the position of the moon and planets is different every year. The front legs of the horse are probably lines drawn between the stars which form the front legs of the horse in the current zodiac sign. These enormous sizes of the horse have to be explained by the fact that they wanted to worship the goddess in order to yield a better profit. The goddess had to see the horse from his/her heavenly position. The sowing time of winter grains was an important time for the Celts. This moment was celebrated at November 1, the date on which all work had been done (harvesting, ploughing and re-sowing). That November 1 was chosen can be explained by the fact that there are astronomical relations and references to the dog zodiac of Sirius. The rise of Sirius on our latitude occurs in November around midnight. Midnight means in this case the time, 12 hours after the moment on which the sun is on its highest point. It is possible that the fact that the grains start to sprout is being celebrated. This sprouting could symbolically mean the transition from death to a new life. 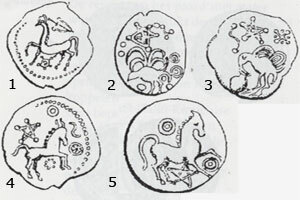 A picture of horses can be found on many Celtic coins. Besides horses, other prints have been used that have a clear relationship with astronomy and agriculture/fertility. In picture 7, you can see three coins form the publication of van Roymans. The coins date from 58-51 B.C. On some coins, a horse is stylishly depicted with the angular head and floating right leg of coin 1 and 2 show comparisons with the horse of Uffington. The picture on the other side of coin 3 shows a resemblance with the head of a falcon, with which they probably try to depict the god Horus, son of Isis. On the backside of coins 1 and 2, grains are being depicted. On count 1, the two rows on the lower right side could resemble sowing rows. 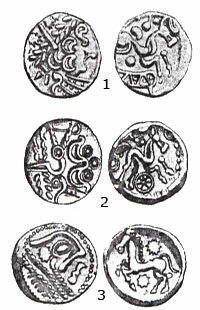 Picture 8 shows five Gaelic coins as depicted in the publication of Nouwen. On coin 1, above the horse a triangular object can bee seen that has a resemblance to a miniature plough form a finding in a grave in the fourth century B.C. (see picture 9). Coin 2 shows a bird with eggs and a plant while coin 3 shows us a bird/chick that seems to be in the embryonic phase and is eating or drinking from a jug. 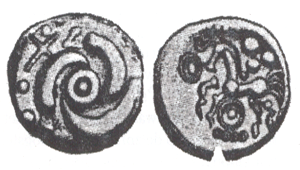 Coin ll3 and 4 show a picture of a sinus curve that can be connected with the ecliptica and possibly symbolically reflect changes in the seasons. The three coins with the horse could be connected with the autumn period when the winter grains need to be sown and the two coins with a picture of a bird could be connected with springtime when the grain plants start to develop after the winter period. The concentric rings on the several coins could be symbols for planets or the sun while the pentagrams are also related to astronomy. The spiral figure on the coin in picture 10 shows a large resemblance with the structure of spiral nebulas known form astronomy. It is impossible to explain how one could see this structure, in that era, without optical aids. A possible explanation is that the Celts have taken our own Milky Way as an example. 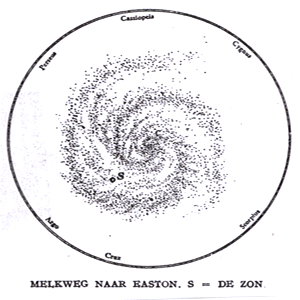 In the beginning of the last century, mr Easton, living in Amsterdam, has mapped our galaxy without optical aids (see picture 11 in which the spiral arms are clearly visible). As you can see, it is possible for the Celts have done the same observations 2000 years before and even have drawn the conclusion that the nebula stains like those of the Andromeda nebula probably have the same spiral structure as our own galaxy. The horns with which the horses on the several coins have been depicted confirm a relationship with a divine power. Coin 1 (picture 8) shows a pentagram with little balls on the angular points under the horse as a result of which there is a resemblance with the dodecahedron. Based on the archaeological context of the dodecahedrons, a relationship with the Celtic period can not be confirmed. When distinguishing an indigenous or a Roman invention is quite difficult because the invention has been done in the first century A.D. There is one point in which the archaeological context of the dodecahedrons show a striking resemblance with the findings of Epona, namely the presence of places where soldiers were stationed. The presence of pictures of Epona in military camps is usually connected with the Roman cavalry. 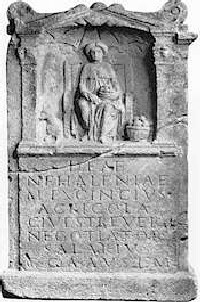 However, if Epona - as a goddess - had an important meaning for agriculture, this could be a clue that the Roman legion soldier also did farming instead of typical military activities in the second and third century A.D. I already told this in my hypotheses about the Roman dodecahedron as a support. I realise that I need to be careful when drawing conclusions because the use of my hypotheses of dodecahedrons as a support for another hypotheses is a long stretch. Nevertheless, it wouldn`t surprise me if someone would do scientific research into the relationship between the use of the dodecahedron and the worshipping of Epona in the near future. In my support I have tried to prove a link between the zodiac sign Pegasus and agriculture/fertility in order to explain the meaning of the horse and the fertility symbols with which Epona is being depicted. As you can see, I haven`t suggested anything about the origin of the goddess Epona. The connection with the Celtic religion is unclear. After all, the fact that she has been worshipped in the Gallo-Roman period, doesn`t automatically mean that she has a Celtic origin. 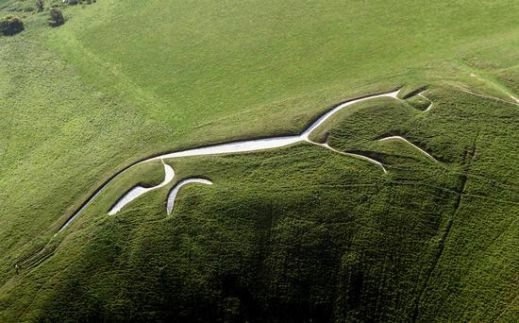 I am convinced that the horse with which she has been depicted as zodiac sign should be associated with the sowing time of the winter grains and therefore has a Celtic origin. Epona, as a goddess, could have a Greek/Roman origin and therefore be the Gallo-Roman equalness of Demeter/Ceres. Especially the mythology of Demeter and her daughter Persephone(Kore) fits completely in the hypotheses of the sowing of winter grains and the yearly cycle of death and rebirth. This mixture between Celtic and Greek/Roman religion could have lead to a new goddess that was of significant importance in the former agriculture society. An important point of discussion is the interpretation of the fertility symbols of Epona and Nehalennia. 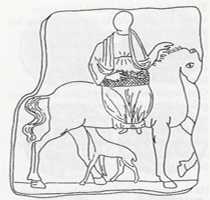 If Nehalennia originally was not related to agriculture, then we should look at the fertility symbols with which Epona is being depicted as sings of prosperity and wealth. If the meaning which Epona has had to farmers was protecting the crops and guaranteeing a big profits, then Nehalennia should have been a symbol for captains and merchants that protected them during their journeys overseas. Whether these profits were gained form agriculture or commerce shouldn`t have made a difference for the Gallo-Romans because both gave them prosperity and wealth. What have these findings and thoughts for use? It is obvious that we cannot speak about scientific proof. The connection - as described above -partially supported with facts is still highly hypothetical. It means that facts that have been known for a long time are placed in another perspective. A picture of a horse is not linked with a real horse (what seems more logically) but with astronomy. A high number of logical explanations becomes less logical but at the same time, it creates new perspectives. If that, what up till now is to some extent speculative, will become less speculative and perhaps will replace some existing insights, highly depends on the reactions of readers. All responses are more therefore than welcome. Bilt van der J., 1919. Sterrenkunde. Boekel, G.M.E.C. van, 1983. Catalogue: Deities and Men,Dwarf with Scroll/Epona. Berichten ROB 33. Clayton, P., 1994. Wereldencyclopedie van de mythologie. Euskirchen, M., 1993 'Epona' Bericht der Römisch-Germanischen Kommission 74, pp. 607-838. Hoffmann, E., 1966. Goden- en heldensagen. Krefeld, H., 1963. Res Romanae. Nouwen, R., 1993. De Romeinse Pentagon-dodecader: mythe en enigma. Publicaties van het Gallo-Romeins Museum, Tongeren,nr. 45. Hasselt. Rolleston, T.W., 1995. De Keltische Mythologie. Roymans, N., 1990. Tribal societies in Northern Gaul. An anthropological perspective. Thun, M., Thun M.K, 1984. Zaai en werkkalender. Uitgegeven door de Nederlandse Vereniging tot bevordering der biologisch-dynamische landbouwmethode. Wagemans, G.M.C., 1996. Mysterie Romeinse Pentagon-dodecaëder ontsluierd? Westerheem 45 no.4 199-207.